GM wants 2.7 billion euros in state aid from countries with Opel factories. 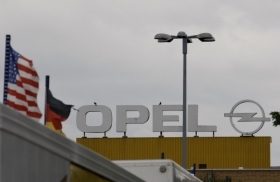 MUNICH – Opel CEO Nick Reilly denied a claim from unions that General Motors Co. is planning to cut 2,000 additional jobs at its Opel/Vauxhall unit. After meeting Reilly on Monday, Opel's European works council issued a statement claiming that GM planned to cut its European headcount much more severely than previously announced. "It is inexplicable that the plan includes more job cuts that have been covered up until now. We see this as absolutely insincere," labor chief Klaus Franz told reporters. But Reilly said: "There is no plan to go beyond the 8,300 job reductions communicated earlier in conjunction with the restructuring." The additional 2,000 jobs refer to employees who had already signed up to a pre-retirement part-time program in 2006 in Germany, Reilly said in a statement. Reuters reported that the number of Opel staff is slated to fall by about 9,960 to a total of 37,700, basing its report on documents from GM's Viability Plan VI. Germany would take the brunt of cuts, with 5,660 jobs to go, Reuters said. Opel has said it needs to cut jobs as part of its plan to reduce capacity by a fifth to counter slow demand for new cars that could stay weak for years. About 4,000 of those cuts would be in Germany. GM angered unions last month with the announcement that Opel's Antwerp plant in Belgium will close, a move one union leader called a "declaration of war." After Monday's meeting,labor officials also said they learned that Opel no longer planned to reduce management costs by 35 percent. "On the contrary, new management staff has been hired," they said. GM has said it wants staff to accept its plan by mid-February to help the carmaker shrink to a profitable size. Insisting that Antwerp stay open, labor has frozen negotiations with GM over the automaker's proposal for 265 million euros ($372.1 million) in annual wage cuts across Europe over the next five years. GM wants 2.7 billion euros in state aid either as loans or loan guarantees to help finance the 3.3 billion euro revamp. All countries that host major Opel manufacturing sites -- except Belgium -- remain open in principle to extending state funding, Reilly said last week. Opel is expected to submit a formal aid application to Germany in days, once the company gets the required independent expert opinion on the viability of Reilly's plan. Reilly has said that Opel has enough liquidity to operate "well into the second quarter.